In 1947 the cooperative started operating the first spray drying milk powder tower ever installed in France. 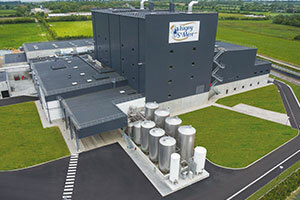 In 1982 Isigny Sainte-Mère installed Multi Stage Drier technology. As a mark of its quality and hygiene, the cooperative’s infant formula milk was the first to be sold in a pharmacy. The existing milk powder production site at Isigny-sur-Mer has three drying towers. In June 2015, a new dedicated infant formula milk site was added. With a total of five drying towers and two packing lines, the capacity for baby milk powders has been taken up to 50,000 tonnes a year. This new production site is part of a long term development strategy which will ensure additional supplies of infant formula milk powders on the world market. The Isigny Sainte-Mère dairy cooperative is located in Normandy, France. Our milk powders are sold in more than 40 countries around the world.